Samsung Galaxy S9, S8, S7 series as well as Note 9 & Note 8 phones are currently the bestselling Android smartphones in the world. 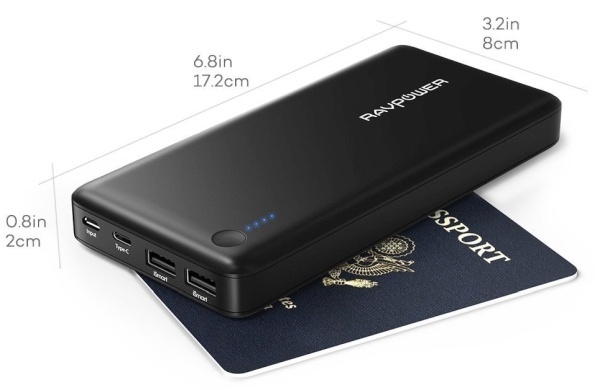 While these phones come with hefty 3000 mah to 4000 mAh batteries, the ever power hungry apps and games have made portable power backup essential not only for travellers and commuters, but also for general users. All the Samsung Galaxy S series, Note series as well as J7, J5, A9, A7, A5, A3 series phones can be charged at fastest speed using USB-C PD powerbanks with output of 18 watt or more. All these Samsung smartphones can also be charged at fastest speed with QuickCharge 3.0 or Quickcharge 2.0 powerbanks. This is because the 18 watt (9 volts @ 2 amps) fast charging mode supported by Samsung phones is supported by both Quickcharge 3.0/2.0. Therefore, if you use Samsung Galaxy S series or Note series smartphones, the powerbank you purchase for your phone will continue to be of optimum use for fast charging even if you upgrade in the future to newer Samsung smartphones. Anker PowerCore II Slim 10000 is our top choice as slim, lightest and most compact fast charging (zero to 50% in 30 mins) capable portable charger for Samsung S9, S9+, S10, S10+, S10e, S8, S8+, S7/S6 and all Note series phones. This powerbank will charge Samsung S9, S9+, S10, S10e, S9 Plus, S8, S7 or Note 9, Note 8 phones at least two times. The PowerCore II Slim 10000 weighs just 7.4 oz (210 gm). It supports 18 watt fast charging and this makes it perfect for fast-charging a huge variety of Android smartphones in addition to all the latest Samsung smartphones including the February 2019 released S10, S10+, and S10e. PowerCore II Slim 10000 will get charged in 4 hours with Samsung chargers that come with S9, S8, S7, Note 9, Note 8 etc. as well as any Quickcharge 3.0 wall charger. Anker PowerCore II Slim 10000 is a robustly built slim portable charger that is easily the most pocketable of all Anker 10000 mah powerbanks due to its slim design. 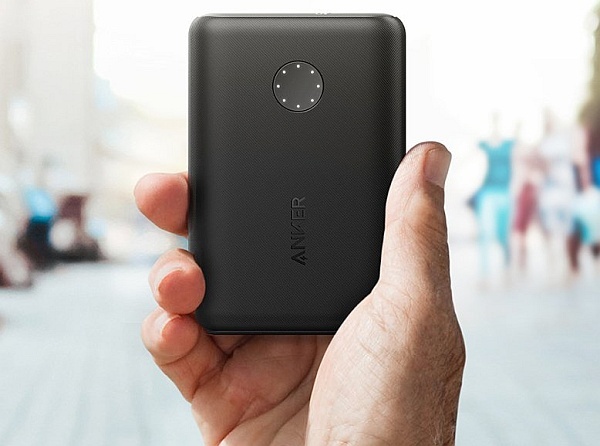 The 0.60 inches slim design of Anker PowerCore II Slim 10000 makes it very pocketable and also allows you to easily hold the powerbank in your hand together with the phone while recharging. Performance-wise, PowerCore II Slim 10000 delivers stable output with excellent fast-charging compatibility for S9/S9+/Note 9 as well as the older S8, S8+, Note 8. In our test-charging session, it fully charged (0 to 100%) Galaxy S9 two times and still had spare battery capacity to again charge it from 0 to 40% (total 2.4 charges for S9). S9+ which has a bigger battery was charged exactly two times. Overall, considering all factors including price, PowerCore II Slim 10000 is a great choice if you need the lightest fast charging power backup solution for Samsung S9, S9+, S10, S8, S7, Note 8/9 as well as J series and A series phones. Excellent compatibility with S9, S9+, Note 9, as well as older S8, S7, S6 etc. 18-watt Quickcharge 2.0 Output & Input suits supports fastest charging for the latest Samsung phones including Galaxy S9+, S9, S8, S8+, Note 8, S7, S7 Edge, S6, S6 Edge, Note 5 Please Note: Samsung phones support Quickcharge 2.0 charging and hence get charged at same speeds with both Quickcharge 3.0 or Quickcharge 2.0. 0.6 inches slim design and 5.4 x 2.6 x.6 inches dimensions make it most pocketable among Anker 10000mah powerbanks. 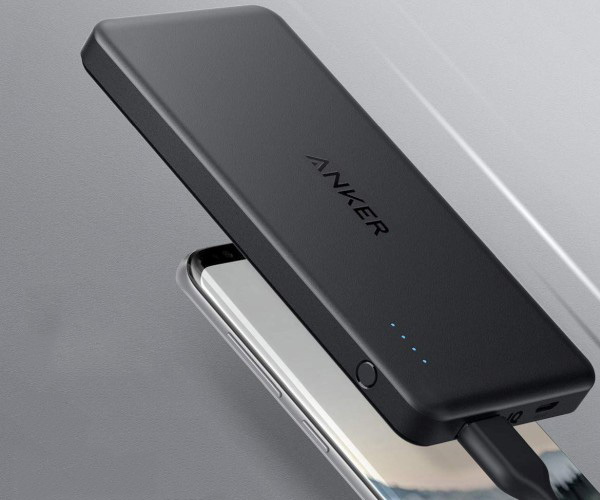 Anker PowerCore II 10000 is our next best choice as fast charging compact powerbank for Samsung S9, S10, S8, Note 9, Note 8 and other Samsung Phones. It will fully charge (0 to 100%) S9, S10, S8, Note 8 etc. minimum two times. PowerCore II 10000 has a weight of 6.8 oz (190 gm) making it the lightest Anker fast-charging 10000mah powerbank for S10, S9, S8. Overall, we found it to be slightly sturdier in build than RAVPower’s slim RAVPower 10000mAh QC 3.0 portable charger. PowerCore II 10000 gets charged in 4 hours with standard Samsung chargers that come with S9, S8, Note 9, Note 8 etc. Supports fastest charging for all Samsung smartphones including S10, S9, and S9+. Fully charges in 4 hours with standard Samsung chargers that come with S9, S8, Note 9, Note 8 etc. Anker PowerCore II 20000 is the our top pick as fast charging 20000 mAH portable charger for Samsung smartphones including S10, S10+,S9, S9+ and S8 thanks to its sleek build and light 13 oz weight. This powerbank will fully charge Galaxy S9, Note 8 etc. almost 5 times and has two USB charging ports. You can recharge PowerCore II 20000 using a Quickcharge charger or the Samsung wall charger that comes with Samsung phones in about 5 hours. It has dimensions of 6.5 x 2.4 x .9 inches and its 2.4 inch width of PowerCore II 20000 makes it easy to grip in the hand alongside your phone. Its 10-position indicator is also better than 4-position indicators on other powerbanks. Almost 5 full charges for S9, S8. Four full charges for S9+. Anker PowerCore II 20000 and RAVPower 20100-C are our picks as fast charging 20000 mah (4 full charges) powerbanks for Samsung S9, Note 9, Note 8, S8, and S7. RAVPower 20100-C is a versatile powerbank that also offers USB-C charging port as well. It can fast charge all Samsung smartphones including S9, and S9+ and can also recharge Google Nexus 6P and 5X at the fastest speed due to its 5 volt @ 3 amp mode support over USB-C.
RAVPower 20100-C also offers full QuickCharge 3.0 charging support allowing it to recharge QC 3.0 compatible phones such as Sony XZ1, HTC U11, LG V30 at fastest speeds. The RAVPower 20100-C portable charger can be recharged using QC 3.0 wall charger in 5 hours. Another strong feature feature of RAVPower 20100-C is its price. At this price point, there is no other powerbank that can not only charge All Samsung phones but also recharge many other top phones at fastest speeds. However, its only drawback is that it weighs 3 oz more than our other pick the Anker PowerCore II 20000. Fastest charging for QuickCharge 3.0 smartphones such as Sony XZ1, HTC U11, LG V30, Nokia 8 etc. All these three excellent powerbanks come with the highest TSA-allowed battery capacity (27000 mah or 100 Watt-hours) and will fast recharge Samsung S9, S8, Note 8, etc. five times. While all the four are perfectly good portable chargers for your S9/S9+/S8/S7/ or Note 8, we are describing their differences in detail to help you make an informed choice. RAVPower 26800 USB-C PD 30 watt comes without any bundled wall charger and it can be recharged either by a standard USB 2.4 amp wall charger in 14-15 hours or by a US-C PD wall charger in 4.5 hours. RAVPower 26800 USB-C PD will also recharge your Macbooks, iPad, Nintendo Switch, iPhone X/8/8+, and most other USB-C Android phones at fastest speed. We recommend buying a USB-C PD 30 watt portable charger such as RAVPower 26800 USB-C PD (instead of a QC 3.0 powerbank) as both Google and Apple are moving towards USB-C PD in their latest phones. The latest iPhones (iPhone X, 8, 8+) also now support USB-C fast charging. Please Note: To charge RAVPower 26800 USB-C PD in 4.5 hours, use a 30-watt+ USB PD wall charger such as RAVPower Super-C USB PD or Anker Powerport II USB PD wall chargers (and not a 30 watt regular USB-C charger). 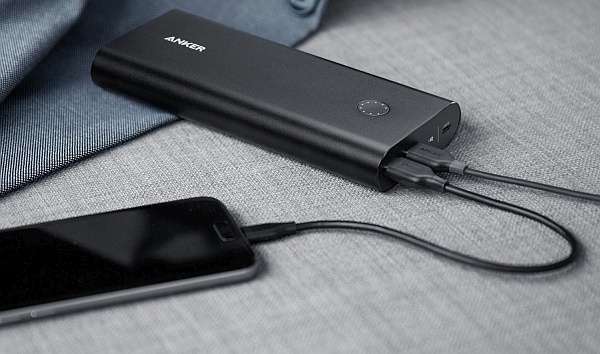 We recommend Anker Powerport II USB PD as it will charge both your PD powerbank and your S9/S8/Note 9/Note 8 simultaneously at fastest possible speeds from a single watt outlet. Can charge a wide variety of phones and devices such as Macbooks, iPads etc at fastest speed. Can also be charged with both a USB-C wall charger or a regular wall charger in about 14 hrs ( using 2 amp wall charger). Anker PowerCore+ 26800 QuickCharge 3.0 with wall charger is a great cost-effective high capacity portable charger option for your Samsungs if you also require a QC 3.0 wall charger. The Anker Powercore+ 26800 will get charged by the bundled QC 3.0 charger in about 7 hours. Using a standard 1 amp USB charger, it will take up to 24 hours to charge. Anker Powercore+ 26800 will also recharge QC 3.0 smartphones such as Sony XZ1, Nokia 8, LG V30, HTC U11, at highest speed. While it is a great choice for fastest charging of all existing Samsung phones including 2019 released S10, S10+, S10e, as well as QC 3.0 Android phones such as Sony XZ1, HTC U11, Nokia 8, etc. the support for QC 3.0 in future devices is uncertain and USB-C PD is more future proof. Anker PowerCore+ 26800 USB-C PD is Anker’s latest version of its PowerCore+ 26800 high capacity powerbank and comes with 30 watt USB-C PD support. It is a great choice if you require both a powerbank and a quality USB-C PD wall charger as the bundled USB-C wall charger will cost almost $30 if purchased separately. The Anker Powercore+ 26800 PD can be charged by the bundled 30-watt USB-C PD wall charger in about 5 hours. The Anker Powercore+ 26800 PD will also recharge all devices requiring USB-C PD such as Macbooks, USB-C ultrabooks, iPad, Nintendo Switch (while being played), iPhone X/8/8+, and most other upcoming USB-C Android phones at their fastest speed. We recommend buying a USB-C PD 30 watt portable charger (instead of a Quickcharge 3.0 powerbank) as both Google and Apple are moving towards USB-C PD in their latest phones and the charging speeds of USB-C PD powerbanks are almost same as QC 3.0 powerbanks. Besides being reasonably future proof, an added advantage of USB-C PD portable chargers is that high capacity USB-C PD portable chargers such as Anker Powercore+ 26800 PD or RAVPower 26800 USB-C PD can be charged much faster over USB-C PD ( about 4.5 hours) than their Quickcharge counterparts (7 hours+). Can charge Macbooks, iPads, Nintendo Switch, USB-C ultrabooks et.c at fastest speed. Does the Anker Powercore 26800 with 3 USB port PowerIQ, is it Compatible with SG note 9? Hi Johner, Yes, Anker Powercore 26800 is compatible with Samsung Galaxy Note 9 but does not offer fast-charging and it takes very long to charge the powerbank (12 hrs minimum). Instead we recommend that for just 3-4 more dollars, you can get Anker PowerCore+ 26800 which will fast-charge your Galaxy Note 9 in half the time and will also get recharged very fast (5 hrs) using the Note 9 wall-charger. Thank you for the guide. I just went ahead and bought the RAVPower 26800 mAh USB C PD charger along with the Anker Powerport II USB PD wall charger (separately).